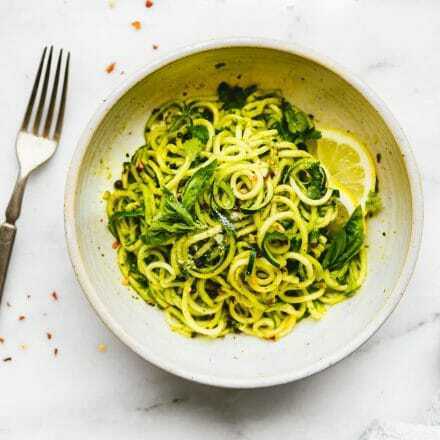 Roasted Poblano Pesto Zoodles are a light, tasty take on pesto pasta, perfect for a spring or summer meal. A low carb, gluten-free, vegetarian dish to make for an easy weeknight dinner. To roast the poblano peppers, preheat your oven’s broiler. Remove the core and seeds from the peppers and slice into pieces. Lay the pieces on a baking sheet. Broil skin side up for about 10 minutes, or until the skins are completely charred and black. Broiling time can vary, so check every 2 minutes or so. Immediately remove the peppers from the oven and use kitchen tongs to quickly place them in a resealable plastic bag. Seal the bag and set aside for 20 to 30 minutes, or until softened. Remove the peppers from the bag. Peel off and discard the skin. It’s okay if a little bit of char remains as it adds to the flavor. In a food processor, combine the peppers, arugula, basil, cilantro, Parmesan, salt and black pepper. Process until the mixture is combined, then stream in the olive oil with the processor running. Spiralize the zucchini into noodles. In a large skillet, heat the olive oil and butter over medium-low heat. Add the garlic and red pepper flakes and cook for 1 minute, then stir in the lemon juice. Add the zoodles and toss well to coat. Cook, tossing often, for 5 to 6 minutes, or until the zoodles soften slightly. Add in the poblano pesto and toss well. Cook for 5 minutes, or until warmed. Serve immediately with basil and Parmesan cheese (or nutritional yeast). Tip: If you’re just getting into zucchini noodles, try combining them with gluten-free pasta. Use half regular gluten free pasta, half zucchini noodles, and toss. It’s a great way to incorporate more veggies and lighten up the meal.